Launched in 1969, Tutti Fotografi is the leader in the Italian market. Target: ama- teurs, professional photographers and dealers. The content covers both the practical photography and the test of lenses and cameras, with the support of the laboratory Centro Studi Progresso Fotografico. TF publishes large portfolios and interviews to the professional photographers and the readers’ photos. 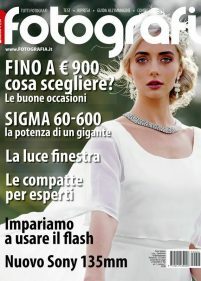 The insert Fotomercato is dedicated to the market: prices, interviews to the dealers, free classifieds. TF makes a large use of the website www.fotografia.it publishing news and the test images.